View of the town of Harrogate in Yorkshire. Harrogate was famous for having a huge green open space near the town centre. It was named the Stray and was created by an Act of Parliament in 1770. 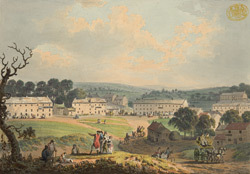 By the late 18th century, Harrogate had developed into a spa town. Water springs were discovered here by William Slingsby which were later found to contain sulphur and iron. The healing qualities of the water attracted many Georgian invalids and the town's building developed accordingly.